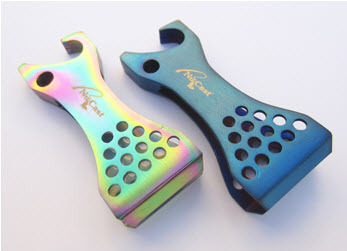 All NuCast Nippers are constructed using high-quality, Japanese stainless steel. Each cutter is specifically designed to cut cleanly and fit comfortably in your hand. Each Nipper has a built-in eye cleaner. Many of our instruments contain Tungsten Carbide cutters for longer life and precision cutting ability. Nippers are available in a variety of colors and sizes to meet your needs. This combination nipper has a wide blade to cut all sizes of line and a bottle opener to pop your top. The wide 2" length thumb pad has a non-slip gripper holes. Built-in eye cleaner.